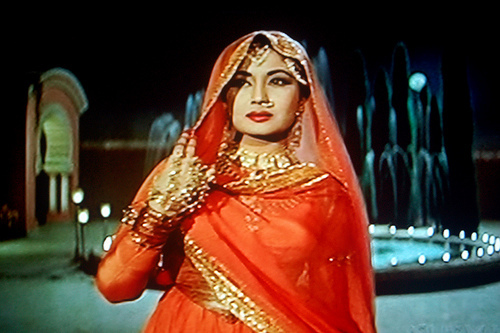 I have always loved the film ‘Pakeezah’ and in the last year or so have become both utterly obsessed with it…and its hero ‘Salim’ (Raaj Kumar), the unknown lover of the courtesan ‘Sahibjaan’ (Meena Kumari) on whom he confers the name ‘Pakeezah’ (pure). The songs of Pakeezah are widely acknowledged as classics, and for good reason; they constitute one of the most beautiful soundtracks ever composed. However, I strongly feel that the film itself, though well regarded, remains considerably underrated. Any short article or fleeting reference to the movie always states something to the effect of “Pakeezah received a lukewarm reception/flopped upon release, and became a big hit, acquiring cult status on Meena Kumari’s death”. This statement is true to the extent that Pakeezah’s commercial success may, at least partially, be attributed to the premature death of it’s heroine, the talented and extremely popular Meena Kumari. The film may well have flopped otherwise. However, the statement is unjust in that it totally ignores and undermines the tremendous intrinsic merit of the film itself, whether evinced in its poetic, understated and nuanced dialogue, powerful characterisation, authenticity of representation, or aesthetic beauty. The last point is amongst the most commonly mentioned, with the first three scarcely being acknowledged. I do believe the grand sets were integral to the film and important in evoking a certain atmosphere and time period, as well as being a manifestation of Kamal Amrohi’s highly developed and refined aesthetic sensibility. However, the greatness of any film, particularly ‘Pakeezah’, cannot predominantly be attributed to a bunch of exotic and beautifully finished sets. They merely comprise one significant factor amongst several other (more important) ones. In this post I would like discuss some of the more neglected aspects of Pakeezah. Stylistically, Pakeezah is extraordinarily subtle and understated for a Hindi film, and is heavily metaphorical. Key visual metaphors include the ‘ghungru’ which adorn Sahibjaan’s feet, the train, the entrapped bird which has its wings clipped by the brothel madame (Nadira), and the torn kite which Sahibjaan likens to herself, as “kati hui, namuraad, kambakht” or “torn and uprooted, unnamed, and ill-fated”. Sahibjaan’s friend Bibban (Vijay Laxmi) seeks to dissuade her from building hopes upon the letter penned by her distant lover, and says “yeh paighaam tumhaare liye nahin….us waqt tumhare paon me ghungru nahi bandhe the”..i.e. “this message is not intended for you..the ghungru (dancing anklets) were not bound around your feet then”. Nature vs Artificial civilisation also constitutes an important trope, with the romance between Sahibjaan and the gentleman stranger developing and unfolding in it’s environs, away from the artifically adorned Gulabi Mahal (Rose Palace) or the magnificently constructed bazaar in which the ‘Inhi Logon Ne’ song is picturised. (1) Colour is also key; when in her own element, away from the artifice her profession requires her to espouse, Sahibjaan is usually wearing white. (2) When pleasurably reflecting on her lover’s note with her head leaning on the edge of the fountain, or when with Salim, during their third encounter, Sahibjaan sports white, as does he- a colour representing purity. When she sings of her heartache and unfulfilled prayers at Salim’s (aborted) wedding, giving expression to her genuine grief, she is again in white, as is he. A seriously neglected aspect of the film is Raaj Kumar’s powerful role and performance as ‘Salim’, the gentleman smitten by Sahibjaan’s beautiful hennaed feet, and who proceeds to take on his grandfather and break away from the family home in asserting his right to love and protect her. Raaj Kumar has been endowed with an extremely attractive character in the film, being extremely shareef, generous hearted and courageous. For me, Raaj Kumar as ‘Salim’ is one of the most attractive male protagonists to have ever graced the Indian silver screen. He plays an integral part in many of film’s most powerful scenes. Indeed, I think one of the most poignant and beautiful scenes both within Pakeezah, and in the history of cinema, is when having broken away from the family home, the couple are standing on a bridge with a picturesque yet roaring waterfall in the background. Sahibjaan (Meena Kumari) is aghast and internally tortured at his having forsaken home and family for her sake. Salim Ahmad Khan: Tum shayad hameesha apne aap ko bhul chuki ho, aur ab mujhe yaqeen ho gaya hai ki tum koi nahi ho sirf meri taqdeer ho. Udhar deko..saara alam tumhaare qadmo par jhuka hai, aur ye subh tumhe salaam karahein hain. Perhaps you have forgotten yourself forever. Indeed, now I am convinced that you are no one, but my destiny. Turn that way, the world is bowed at your feet, and this morning offers its salutations to you. Pakeezah: Lillah! Chup hojaiye. Intne pyar se meri jaan mat lijiye. Main iqraar kiye leti hun, mujhe sab yaad hai ki mai kya hun, kaun hun. Dear God! Please be quiet! Don’t take my life with so much love. I confess, I remember everything, what I am, who I am. Salim: Kaun ho tum? Kaun ho? Pakeezah: Main beqasoor hun. Aap ne yeh samjhaya tha. Aap ayen. Apneh khat likha aur phir aap ne kabhi mujhe chain se sone nahi diya. Haar raat aap mujhe pukaarte hue guzarte rahe. Har roz, meri ruh meri badan se khich ti rahi. Door hi door main aap ki hasrat mein doob kar mar jaati, magar aap ne mujhe doobne bhi nahi diya. Main bhaag jatin, lekin aapke kheme ne mujhe gher liya. Aap agaye, aur aap ki dil ki dharkano ne ye mujhe keh ne bhi nahin diya ke main ek tawaif hun! I am without guilt. You taught me this. You came. You penned that letter, and then you took away all respite. Every night, you passed by calling out to me. Everyday, my soul tore away from my body. Far away, I would have drowned, consumed by my longing for you, but you wouldn’t let me drown. I would have run away, but your tent encompassed me. You came, and the beating of your heart didn’t even permit me to say that I am a prostitute! The extent of his love for her, his idealisation of her, and his evocation of all natural creation bowing at her feet, tears at her heart. Her knowledge of her reality, the artificially adorned yet sordid environment from which she has come, compel her to cry out. At the same time, her words ‘Main beqasoor hun’/’I am without guilt’ are a fundamental affirmation of her inherent innocence; her profession is something she was born into, something the film adverts to as ‘dozakh’ or ‘hell’, with it being near impossible for women entrapped in it to extricate themselves from it. More important than what is said, in this scene, is what is left unsaid. The way she falls sobbing at his feet, and the tenderness with which he picks her up, after a pause, means much more than all that preceded it. I have always found the part where he lifts up and comforts her very moving, the music in the backdrop also being key to the effect created. While this film certainly employs very cultivated sounding Urdu, none of the characters are overly voluble in it, and it’s understated character and extensive employment of metaphor is something rare in Hindi cinema. An example of this understatement is where Pakeezah and Salim are riding away in a horse drawn carriage. They are doggedly pursued by a ‘Hashim Khan’, one of Sahibjaan’s former patrons who has recognised her, and attempts to accost her. Salim inquires of Pakeezah ‘Kaun hai ye?’ -who is this? And she responds ‘kis kis ka naam poochenge aap’ –(this is harder to translate but roughly means ‘how many names will you ask of me?’). Another scene which is both deeply romantic and accurately captures the manners and sensibilities of the era is where Salim enters upon Pakeezah in his tent, who overwhelmed and made acutely self conscious by his arrival, feigns sleep. Having observed her feet, and recognised her he walks outside the tent and addresses her from the other side of it (improvised purdah). He begins with a ‘tasleem’ (a sort of more ornate word for salaam) and proceeds to ask her about herself. Now, I am pretty sure that the practice of purdah had very regressive implications, and did severely curtail women’s opportunities and thier capacity to interact with and experience the broader world. That said, this particular scene did for me bring out a certain beauty and charm in it. The respect and courtesy he wishes to accord her, and his desire not to affront her by addressing her directly, is evident in his chosen means to conduct the conversation with her. As he is about to leave the following day she coyly speaks from behind the tent side saying ‘sunye, raat hone se pehle zaroor laut ayega’/‘please return before night fall’ and he smilingly responds ‘zaroor’- /‘most certainly’. It was simply another age. While the movie was released in 1972, it is obviously set in and captures the aura of an earlier period. The total absense of modern forms of transport and utilities (excluding trains and telegrams which had been around for ages) suggests that it was set prior to independence (pre-1947) or even earlier. It is just so difficult for people today, to envisage romance of that sort, relations between the genders were far more restricted then but when there was interaction of this kind (which was itself very modest and restrained), perhaps its pleasures and charms can only be grasped at fleetingly by us. The movie is incredibly authentic in how its portrays North Indian Muslim upper-middle class culture of that era. We only see fifteen minutes or so of Salim Ahmad Khan’s family, and yet the portrayal is highly authentic and not overstated. The house (or haveli), the manner and conversation of its inmates, the intimidating visage that is Salim’s grandfather ‘Hakim Sahab’ (played by Sapru) all appear quite true to life. The character of Hakim Sahab was evidently a representation of Kamal Amrohi’s own father, and some of the exchanges between Salim and the head of the household, are verbatim reproductions of domestic exchanges which took place in Amrohi’s own household. E.g. the line “Jo log dudh se jaljaate hai woh chaon bhi pukh pukh ke peethe hain”/”those who are burnt by milk take care even in drinking the froth” and Salim’s response “absos ki log dudh se bhi jal jaate hain”/ “It’s a pity that people are even burnt by milk” constitutes one such line extracted from Amrohi’s own life. (3) Domineering, intimidating and tyrannical patriarchal figures were not, in those days, just the stuff of story books. Many families of that period would have a comparable reference point, and Salim’s actions required great courage and conviction, given the times. His parting lines “Yeh kisi dal dal kohre se bani hui havelli hai..yeh kisi ko panah nahi de sakti hai…yeh bari khatarnaak jaga jai…chalo yahaan se”/”This mansion is made of fog…it cannot offer anyone protection…this is a dangerous place…let us leave here” is a powerful indictment of the society which he seeks to break with – one without compassion, harsh, rigid and rendered fragile by it’s pompous self-importance. I also like smaller details which are etched out and are (and are meant to be) highly suggestive of character. When Salim first takes Pakeezah to his home, the nature of his interaction with the women of the family and others, shows the kind of man he is, and we adore him. His affectionate and playfully reassuring demeanour towards his (I think) grandmother who breaks down crying when she relates that Shahabuddin (Ashok Kumar) is ill at a government hopital in Hyderabad. His respect and observance of ettiquete towards the older women of the family, his more casual kindliness towards his other cousin, and lol…his gallantry and amusement when the giggly maid (I think milkwoman) flirts with him. Yet, she can try to flirt with him so openly and make passes at him without fear, because she knows he’s a decent man. Her overtures will never be presumed upon. I’ve seen the movie so many times that even its minutae is very memorable for me. The scene where Salim takes Pakeezah to the mosque to be married, and she flees from the marriage ceremony crying “Nahi!..Nahi!”/ “No! No!” in response to the Kazi’s (priest’s) solicitation of her consent to the marriage is another powerful scene, as is her return to Gulabi Mahal (the Rose Palace) where she likens prostitutes to adorned corpses, whose souls are dead. The film is not without flaws: Admittedly Meena Kumari is a little too passive in the first half of the film, with the first half being a little too languidly paced. Amrohi has deliberately kept it so, but I do think he becomes slightly self-indulgent at the expense of the viewer. Though not something one would term a ‘flaw’, one also can’t help wishing that Meena was as beautiful in the latter part of the film as she was in the first half. Several of the romantic scenes bear the stamp of her illness and deterioration (and yet succeed in being deeply romantic). I think some of the inflections of tone and acting are also reflective of the demeanour and gravity of an older woman, not the seventeen year old she is playing. Though the song is intensely romantic as it is, just think of the even heightened romantic potential of the “Chalo Dildar Chalo, Chand ke Paar Chalo”/ “Come beloved, let us go beyond the moon” song had Meena been able to show her face, with the camera being able to focus more on this joyous couple, and less on their surroundings. She is so young and beautiful when around all these creepy, dissipated nawabs, but when the real hero of the show comes along, we have a considerably older and very ill Meena Kumari. I totally melt at Raaj Kumar’s expression here. (1) Shweta Sachdeva Jha, “Frames of Cinematic History: The Tawaif in Umrao Jaan and Pakeezah” in Narratives of Indian Cinema (ed) Manju Jain. Primus Press, 2009.